Irelands largest island. Connected to the mainland by bridge since 1887. 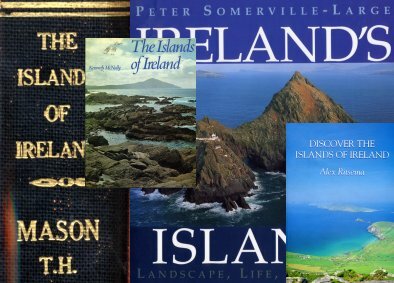 Irelands most famous and most visited islands. Stones of Aran - Pilgrimage by Tim Robinson is probably the best book about any Irish island. The biggest and most populous of the Donegal islands. After independence in 1922 the British navy had a base here until 1938. The small number of people who lived on Blasket have left an amazingly rich legacy of writings about their community and way of life. The Great Blasket was finally abondoned in 1953 after a drowning tragedy. A beautiful hilly island, Cape, in Roaring Water Bay, is the most southerly land in Ireland. Robert Lloyd Praegar, a botanist, inspired and led the Clare Island Survey in 1909-1911. The survey documented the plants, animals and placenames of the island. Many people will tell you that there are 365 islands in Clew Bay, one for every day of the year. Islands of drowned drumlins which were formed by stone and gravel dropped from melting ice at the end of the last Ice Age. A maze of islands, some linked to the mainland by causeways and bridges. Three small islands off the coast near Donaghadee - Big Copeland was formerly inhabited, Lighthouse Island is the location of a bird observatory and Mew Island is the location of the lighthouse. A small uninhabited island 300m off Dalkey one of Dublin's most affluent suburbs. This spectacular sea stack was joined to the mainland until 1393. Dursey has, since 1969, been connected to the mainland by the only cable car in Ireland. Off the Mullet, no longer populated Duvillaun is home to sea birds and has early christiian ruins and crosses. A superb garden in West Cork with many plants which need a mild frost free climate. A formerly populated island now only occupied by summer visitors, rock climbers and sea kayakers. A group of large and small islands some of which are are inhabited while others have some summer residents. In Roaring Water Bay, Heir is a lowlying attractive island wtih lots of summer houses. Off the coast of Connemara, owned by Richard Murphy, a poet, until 1998, this island is the subject of a book - High Island - An Irish monastery in the Atlantic. The largest of a group of islands it is the only one inhabited. An attractive, low lying, fertile island with a fine harbour. A small island between the coast and Tory. Off the Mullet Inishglora has early christian ruins. Formerly inhabited, these islands are the winter home for thousands of barnacle geese which spend the summer in Greenland. The islands were abandoned a few years after a terrible drowning tragedy in October 1927. The middle island of the Aran Islands. Inishmurray people made part of their living by distilling and selling poteen. One of the essential ingredients, sugar, became expensive and scarce during the Second World War and the island was abandoned in 1948. The island has fine early christian ruins. The easternmost and smallest of the Aran Islands. North of Malin Head, Inishtrahull is at the very farthest north of Ireland. Except for lighthousekeepers the island was abandoned in 1928. Inishturk is a rugged island in the Atlantic with beautiful beaches. On August 15 each year there is a pilgrimage to nearby Caher Island which has some fine early Christian ruins. A small island off near the fishing and sailboat harbour at Howth an affluent suburb of Dublin. The island is a Special Protection Area (SPA) under the E.U. Birds Directive and is one of the five sites in Ireland where gannets breed. A privately owned island with an early 20th century house designed by Edward Lutyens for Cecil Baring a wealthy banker. Maínis or Mweenish Island in South Connemara. Inhabited since prehistoric times, Omey can be reached at low tide by walking or driving across the sand from the mainland. High Island, site of an early Christian monastery is not far away. The name says it all. The island is a bird reserve. Off the north coast of Antrim. Scotland is easily visible only a few miles away. A group of islands in West Cork. In summer the bay is crowded with sailboats and the islands have many holiday homes. The Saltees are a wonderful place for birdwatchers. The late owner, Prince Michael the First declared that all people, young and old, are welcome to come, see and enjoy the islands, and leave them as they found them for the unborn generations to come. Scariff and Deenish are tow small, now uninhabited islands in Derrynane Bay, County Kerry. There are is one habitable house on Deenish and ruins a couple of others. The 1911 census recorded one family on the island. The two islands form a Special Protection Area (SPA) under the EU Birds Directive. Set in the Shannon Estuary, a few minutes by ferry from Kilrush, Scattery has monastic ruins including an impressive Round Tower..
Set in Roaring Water Bay, a few minutes by ferry from Baltimore, Sherkin has lovely beaches and many holiday homes. Two spectacular rocks in the Atlantic, one is the site of the second largest gannet colony in the world. The other, Skellig Michael, rises steeply to 200 metres above the sea and was inhabited by monks from early christian times until the Middle Ages. There are well preserved stone beehvie huts used by the monks. Seabirds, a lighthouse, a martello tower and some early christian ruins. Five spectacular remote islets about 2km north of Benwee Head in northwest Mayo, large numbers of seabirds, inlcluding the rare Leach's Storm Petrel, breed on the islets. Valentia, a large and populous island, has been linked to the mainland by bridge since 1971. Points of interest include old slate quarries, an early transatlantic cable station and some excellent dinosaur footprints. Dave Walsh's guide though devoted to islands primarily from a sea kayaking point of view, includes a great deal of general information about nearly all the islands around the coast. See particularly the Oileáin page and download the file. Census of Ireland 1851, 1901 & 1971 onwards plus census results as published in various books. Thanks to Dave Walsh and Sean Pierce of the Irish Sea Kayaking Association for all photos marked DW or SP. Thanks to Guenter Friedrichs for all photographs marked GF. There are a very large number of islands around the coast. These pages aim to deal with some of them.